I've had a couple of them over the years so I could make simple salads quickly, but I always ended up throwing them away after a few uses, for a simple reason: They're difficult to clean. You may be saving 3 minutes by using a fancy chopper rather than a knife and a cutting board, but then you're losing these 3 minutes right back because you can't put the chopper in the dishwasher, so you have to carefully clean all of its twists and turns. Some of them have parts that you can put in the dishwasher, but so far I haven't seen one where the main part, the one that has the fancy mechanism, can be put in the dishwasher. 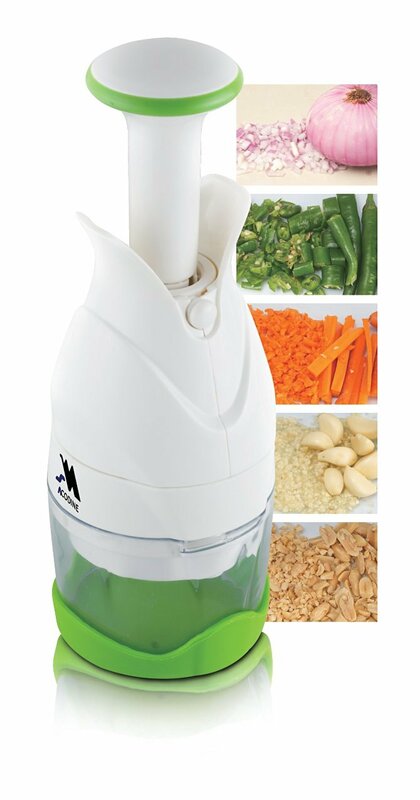 Do you happen to know a salad chopper that could be put in the dishwasher entirely for easy cleaning? A lot of formally not dishwasher-proof gadgets - if they are not electric, and do not contain wood or non-stainless iron parts - do fine in the dishwasher. The most critical thing here would be the blades, and at least one of the ads suggest the blades are dishwasher proof - no sharp blade LOVES being in a dishwasher, but this suggests the alloy chosen being corrosion-proof enough to get by. Alternative or "green" detergents, or minimizing detergent use, might be a bad choice though, since these are often less effective at dissolving/dislodging food scraps inside things. While it is difficult to prove a negative, I would not expect to find such a gadget at all. The problem is that a dishwasher dulls blades badly, and the blades in a chopper cannot generally be sharpened (you cannot fit a sharpening stone in there). So, there is no good technical solution for your use case. If you find somebody who wrote "dishwasher safe" on their chopper, go ahead and try it. Maybe their engineers found some innovative way around the problem. But it is also possible that they simply wrote that there, disregarding the problem that will occur after several washing cycles. Also, most of them will likely simply expect you to clean the chopper by hand, that would explain why you have trouble finding one rated for the dishwasher. Have you tried using a hinged chopper? Less moving parts and presumably less to clean. Not the answer you're looking for? Browse other questions tagged equipment cutting or ask your own question. Why not put knives in the dishwasher? How can I prevent the odor in my dishwasher? Can you put egg shells down the garbage disposal unit? How come my dishwasher leaves grime on dishes? Can you put All-Clad LTD2 in the oven? Sanitization, disinfection, sterilization of Dishwasher?